It doesn't get any better than this! 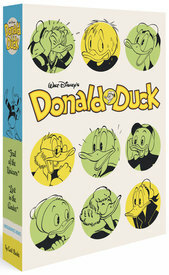 This two-volume, slipcased box set contains Donald Duck: "Lost in the Andes" and Donald Duck: "Trail of the Unicorn", which between them contain some of the greatest comics of all time. Click on the above titles to read our original reviews of each volume.